You discovered Norwood's First Tableau. You discovered Norwood's Second Tableau. You discovered Norwood's Third Tableau. You discovered Norwood's Fourth Tableau. You discovered Norwood's Fifth Tableau. You discovered Norwood's Sixth Tableau. You discovered Norwood's Seventh Tableau. You discovered Norwood's Eighth Tableau. You discovered Norwood's Ninth and Final Tableau. You reset the Hotel's wireless router. You made it into your room, 204. 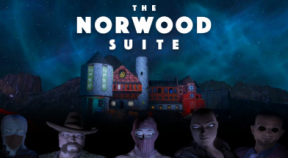 You broke into the Norwood Suite. You've assembled and worn The Costume. You disrupted DJ Bogart's dance party. "We hope you enjoyed your stay..."
You completed The Norwood Suite.